Hello Friends! Hope this morning is off to a great start! It definitely should be after you see all of the inspiration I have on the blog today. 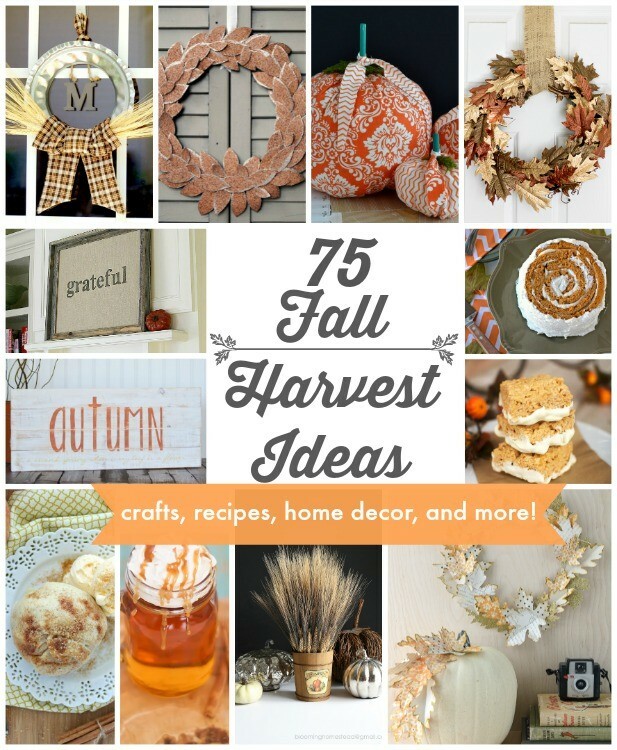 I’ve teamed up with a group of 75 bloggers to share tons of Fall Harvest Ideas with you! From crafts, to recipes, to home decor and more…we sure have you covered for Fall inspiration! If you’ve been to One Krieger Chick lately, you may have seen my Fall Home Tour…I created many new projects for the tour that I hadn’t had a chance to share on the blog. 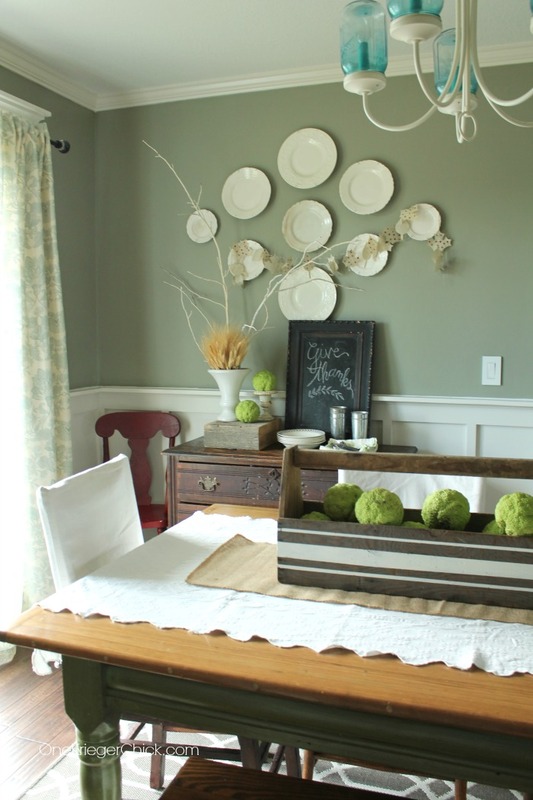 Well, today I am sharing how I created my Simple Dining Room Centerpiece. 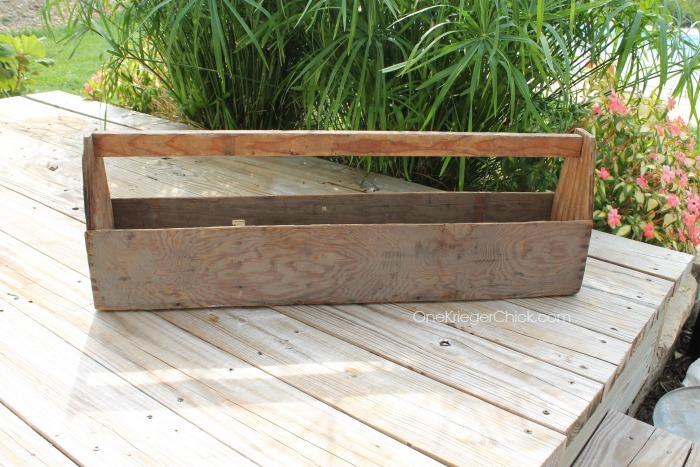 It started like this…a plain old toolbox I rescued from the grain bin. Oh, I love it just like this. I actually hated to do anything to it, but it looked too plain when I set it on the table. Plus, I may have a hard time leaving any surface alone. So, I decided on a grain sack stripe…perfect for my country style. And SO easy to create! This entire project took about 30 minutes. 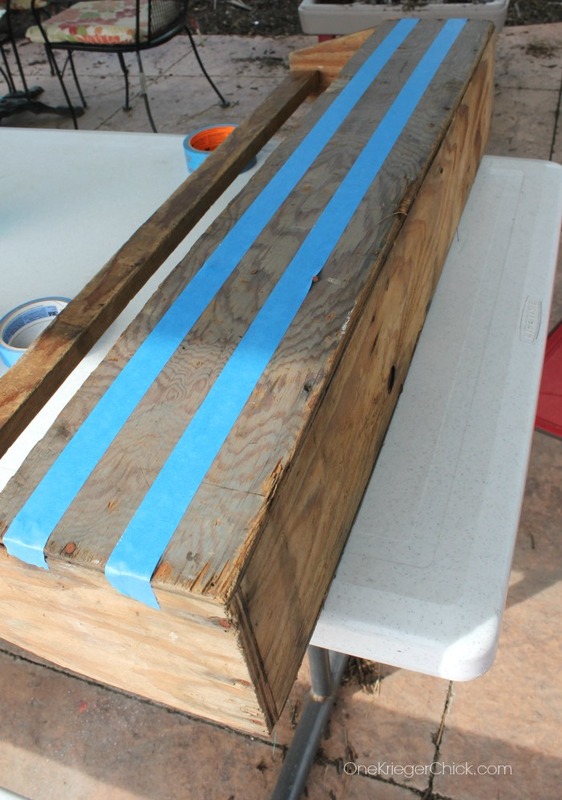 Start by measuring where the stripes should be. Tape off the middle stripe. 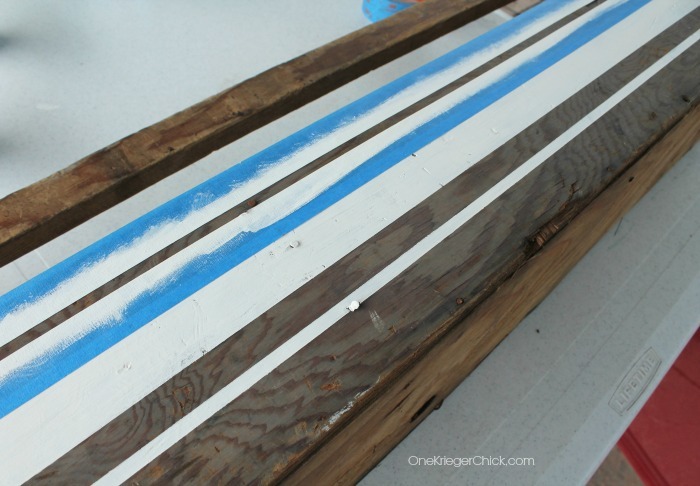 Then paint in between the tape lines. 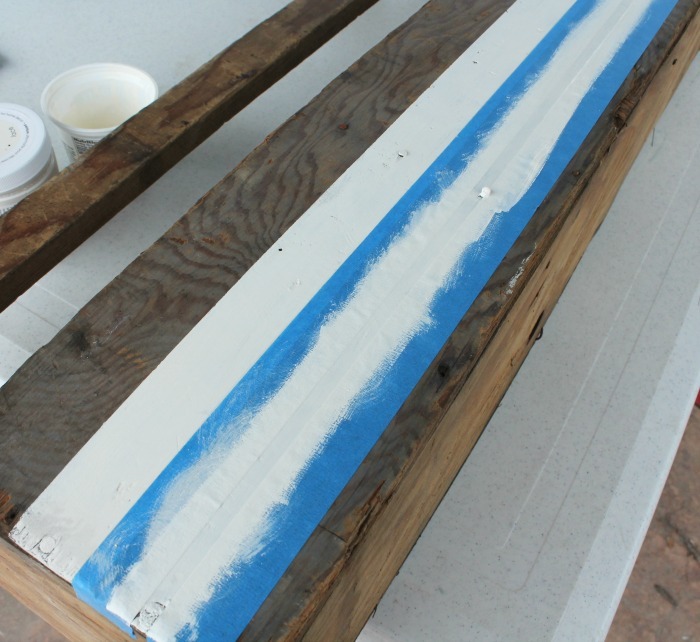 Once that paint has dried, peel it off and use it to tape off smaller stripes above and below the large stripe. I taped and painted one side at a time, making sure to match up the tape lines on each side. When the toolbox was finished, I filled it full of hedge apples. Perfect for Fall, but I think it has fun possibilities for each holiday. 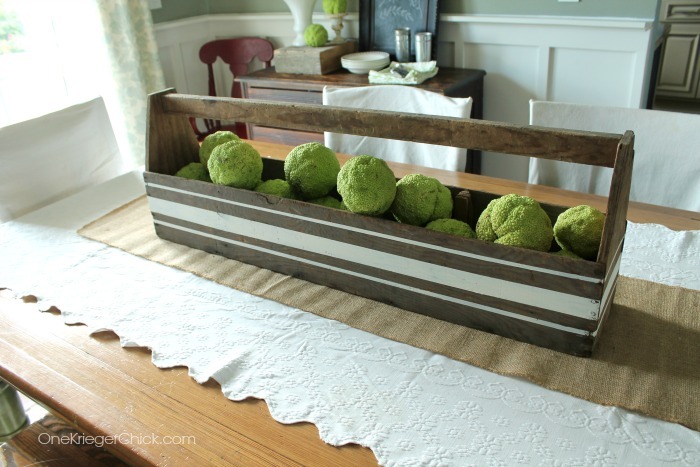 I love how it turned out …Sometimes the best projects are the simplest! Make sure to check out the gallery below and visit some of my blogging friends to see their awesome ideas!! Don’t you just love old items? 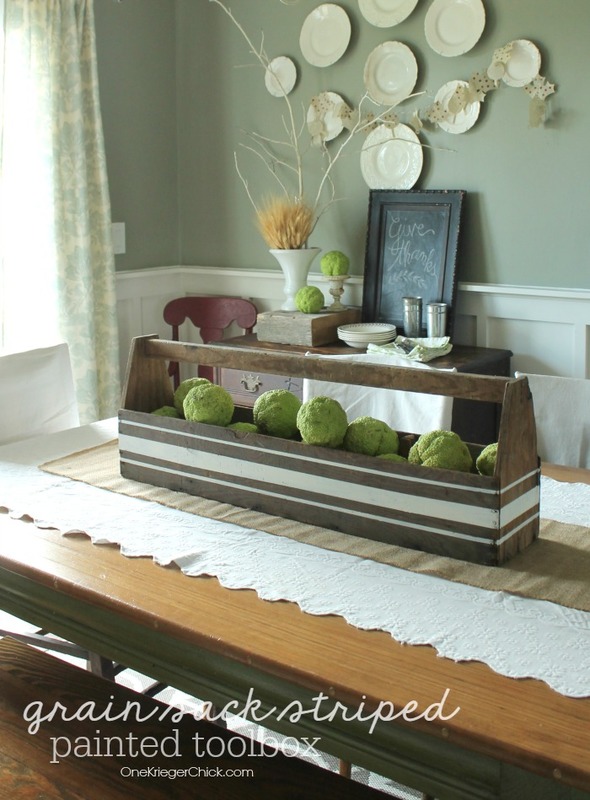 Your centerpiece is beautiful and perfect to keep out all year long! This piece looks great!! My parents have one in their shed that I might be running over a grabbing now. Your style is always spot on Ariean! This detail on your tool box really makes your centerpiece truly classy and elegant! So fabulous, Ariean! Thanks for linking up to the Do Tell Tuesday party.